Well presented and comfortably furnished ground floor apartment. Having the benefit of its own private entrance. Bay fronted sitting room with comfy three piece suite, Colour TV, Video/DVD Combi, CD Player open to Dining area with large table and six dining chairs. Kitchen, having modern fitted units, inset electric oven and hob with extractor hood over, washing machine, fridge with ice compartment, microwave, kettle, toaster etc. Bedrooms: two double beds & child size z-bed, travel cot and high-chair. Bathroom/WC with electric shower over bath. Electric night storage heaters. 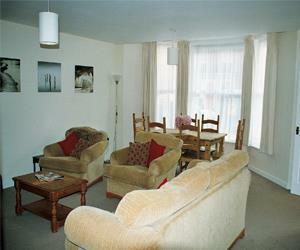 The property is ideally located within easy reach of Cromer town centre amenities, pier, beach and sea. SORRY NO PETS ALLOWED * NON SMOKERS ONLY Accomodation comprises: *Sitting room with dining area *Fully fitted kitchen *Bathroom/WC with electric shower over bath *Two bedrooms *Electric night storage heaters Facilities Included: *Pillows, duvets and linen are supplied for each bed *Electric hob & oven, fridge, microwave, washing machine, TV, Video/DVD combo, CD player *2 double beds, small z-bed. Outside: There is a small garden area to the front Priced: 4 persons. Small Z-bed, travel cot & high chair included Availability: All year, Short breaks out of season.